behavior and development. As a result, the vast majority of Christian kids today have a woefully inadequate spiritual foundation. Fun and games are fine, but as the research indicates, we are raising a generation of children who have missed out on essential Bible training. When the world comes calling, many are falling prey to dubious activities and deceptive philosophies–and walking away from the faith. 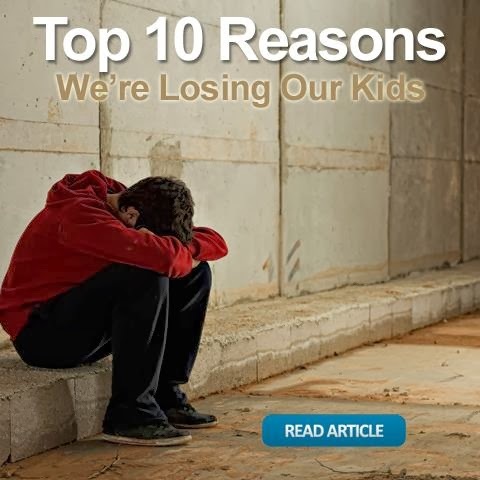 In this week’s timely article, Marc Solas presents ten reasons why we’re losing our children. Have you noticed this word is *everywhere* in the church since the seeker-sensitive and church growth movements came onto the scene? (There’s a reason and a driving philosophy behind it, which is outside of the scope of this blog.) When our kids leave home, they leave the manufactured community they’ve lived in for nearly their entire life. With their faith as something they “do” in community, they soon find that they can experience this “life change” and “life improvement” in “community” in many different contexts. Mix this with a subjective, pragmatic faith and the 100th pizza party at the local big-box church doesn’t compete against the easier, more naturally appealing choices in other “communities”. So, they left the church and…. Our kids leave because we have failed to deliver to them the faith “delivered once for all” to the church. I wish it wasn’t a given, but when I present law and gospel to these kids, the response is the same every time: “I’ve never heard that.” I’m not against entertaining our youth, or even jumbotrons, or pizza parties (though I probably am against middle aged guys trying to wear skinny jeans to be “relevant). It’s just that the one thing, the MAIN thing we’ve been tasked with? We’re failing. We’ve failed God and we’ve failed our kids. Don’t let another kid walk out the door without being confronted with the full weight of the law, and the full freedom in the gospel. This article first appeared on Marc5solas and is used with permission.